HBF Reader Coupon! As of this posting, coupon code HBF5OFF takes an additional 5% off. 5% usually wouldn’t be too great of a discount in an of itself. The reason it’s outstanding in this case is that it stacks with some of the best homebrew keg deals available. This sweetens some already great deals to make some outstanding deals. This entry was posted in Draft, Great Deals, Keg Connection, Made in the US, Tubing on April 1, 2019 by admin. Use to… measure things 🙂 around your home brewery. These would also be handy for rehydrating yeast. This entry was posted in Amazon, HBF Tested, Made in the US, Measuring on March 1, 2019 by admin. 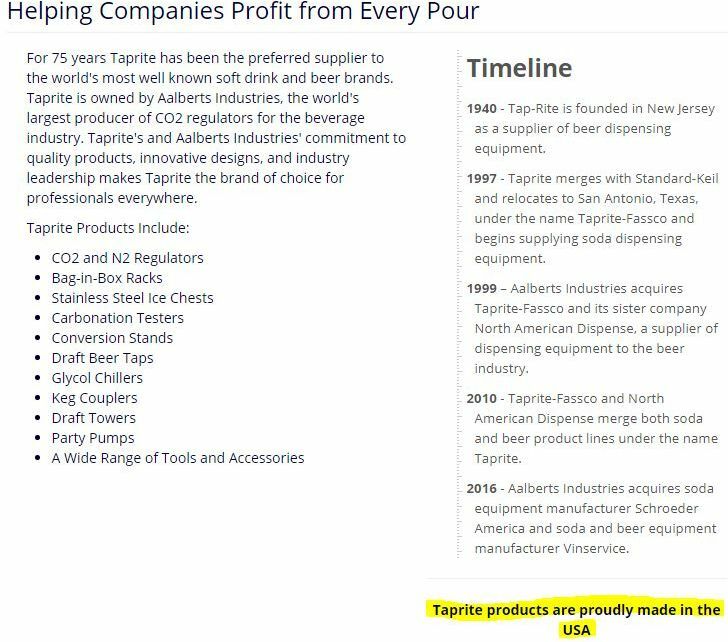 This entry was posted in Amazon, CO2 Hardware, Draft, Kegerator, Made in the US, Regulators on February 28, 2019 by admin. This entry was posted in Draft, Keg Connection, Made in the US, Tubing on February 24, 2019 by admin. Best Price: We have recorded deals on this on six occasions dating back to 2015. This is the best price I’ve seen by $2. MoreBeer could have sold it for less, but this is the lowest I’ve seen. This entry was posted in Draft, Drip Trays, Kegerator, Made in the US, More Beer on February 1, 2019 by admin. This entry was posted in Draft, Keg Connection, Made in the US, Tubing on January 9, 2019 by admin. Use in combination with disposable oxygen tanks (available at most hardware stores) to oxygenate your wort or must. Generally speaking, oxygenating reduces lag times and aids in a more vigorous fermentation. As of this posting, William’s Brewing has this for just $19.99. Check the product page for up to the minute price and availability. Also.. check out their full line of wort aeration gear for other setups, including packages with aerating stones, wands and more. 40% Off Clearance! William’s has launched a year end clearance sale. Loads of items are discounted by 40%. They are suggesting that you order early because selection is limited and they only have a few of some items. No coupon or promo code is required. Add items to your cart to see discounted price. Check William’s for current selection and availability. This entry was posted in Fermentation, Made in the US, Oxygenation, William's Brewing on January 1, 2019 by admin. This entry was posted in Great Deals, Made in the US, More Beer, Propane Burners, Recent MoreBeer on December 14, 2018 by admin.